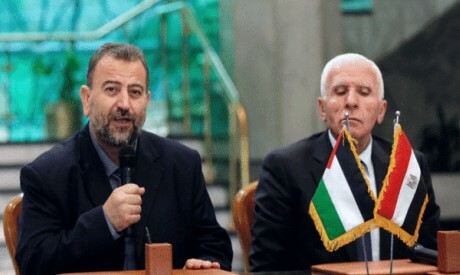 Delegations from the Palestinian Fatah and Hamas movements held separate meetings in Cairo this week to discuss reviving the Palestinian reconciliation process. While the Hamas delegation announced its approval of the latest Egyptian proposal to promote inter-Palestinian reconciliation, the Fatah delegation returned to the West Bank for consultations with President Mahmoud Abbas. Sources close to the talks in Cairo say President Abbas wants a formula that guarantees the Palestinian Authority’s “full empowerment” in Gaza, something Hamas rejects. Fatah and Hamas interpret the two agreements very differently. While Saber says the agreements place the question of security in the hands of special committees, some Fatah officials interpret the agreements as meaning all weapons and military-related movements of the Palestinian factions should be subordinate to the PA. It is a view, says Saber, of people who “want to use the weapons of the resistance as a tool to sabotage the reconciliation project”. After the latest round of talks in Cairo with the two main Palestinian factions the reconciliation process appears to have reached a murky crossroad. Hamas, which has just thrown the ball into Abbas’ court, believes there is no need for a new agreement and that the roadmap laid out in previous agreements will suffice as long as the parties agree to “empower a consensus government” to eliminate the effects of the inter-Palestinian rift and then oversee arrangements for general and presidential elections. Fatah’s position was voiced by Abdallah Abdallah, chairman of the Political Committee of the Legislative Council, who said Fatah would follow through on the executive measures stipulated under the 2017 agreement, starting from where the process was interrupted by the assassination attempt on Prime Minister Rami Hamdallah during his visit to Gaza in March. Fatah insists the 2017 agreement supersedes the 2011 agreement, and Abdallah criticised Hamas for attempting to rehabilitate the earlier document. According to a source connected to the talks in Cairo, the gap between the two camps remains wide. “The parties’ calculations are factional and neither side wants to make a concession to the other,” he told Al-Ahram Weekly. But the distance between the two sides is not limited to factional disputes. “There are external dimensions such as the current position of the PA and the pressures it is facing in its relations with the US. Then there is the Israeli position on Gaza and the truce project. In addition, the second installment of funds from Qatar is due to arrive which means Hamas can avert financial crisis and does not have to remain constrained by the PA’s punitive use of the finance card,” said the source. The PA has often cut or threatened to cut budget allocations covering civil servants’ salaries and electricity, healthcare and other government services in Gaza as a means to pressure Hamas into making concessions. A point of principle that continues to divide the two sides is their differing interpretations of what “empowerment” means in Gaza. To Hamas it means empowering the consensus government stipulated under earlier agreements while to Fatah it means restoring full control over Gaza to the PA.
Cairo, say sources, is eager to “disengage” the two sides from issues that threaten to obstruct any consensual formula and wants them to implement the articles of the 2017 agreement within two months and to create specialised committees, with Egyptian collaboration, to deal with the most complex issues in a gradual manner. Sources in Cairo say President Abbas is unlikely to approve the latest formula to which Hamas agreed which calls for the creation of a consensus government to oversee preparations for general elections in 2019, and add that it is difficult to discern what the next steps could be if Abbas rejected Cairo’s proposal. The only certain thing is that Cairo will continue to try and bridge the gap between the two sides. Cairo will also continue working to ease the blockade on Gaza and promote the ceasefire, issues which surfaced during the talks in Cairo because of the volatile situation at the border between Israel and Gaza. Israeli manoeuvres along the border included drills for an incursion into Gaza which observers say suggests a possible change in the rules of Israeli engagement. Contributing to the volatility is Hamas’ refusal to create a buffer zone along the border and to destroy border tunnels. Israel, meanwhile, is continuing to build a border fence which is due to be completed by the middle of next year and to deploy “Iron Dome” batteries along its border with Gaza.